"Seek the Lord and Live"
The mind, someone said, is never satisfied, never. That’s because it faces a cruel paradox: the mind, which can contemplate the eternal, is composed of matter that isn’t eternal—and, worst of all, the mind knows that it is not eternal. Like chickens and oysters, we are going to die. The difference, however, is that chickens and oysters don’t know it. We do—and that realization causes us a great deal of anguish and suffering. How did we get into this mess? The answer is, of course, one word: sin. Sin leads to death. Humans sin—therefore, humans die. It doesn’t get simpler than that. “Therefore, just as sin came into the world through one man, and death came through sin, and so death spread to all because all have sinned” (Rom. 5:12, NRSV). Death as part of life? If that sounds absurd and paradoxical, it’s because it is. Death is the negation of life, not some aspect of it. In this context, we come to this quarter’s lesson. Perhaps it can be best expressed by the famous quote, in which Ellen G. White writes that the great theme of the Bible is “the work of God in laying the glory of man in the dust, and doing for man that which it is not in his power to do for himself”—Ellen G. White, The Faith I Live By, p. 109. That’s the theme we are going to study, that of God doing for us what we can never do for ourselves, which is to give us the gift of life, eternal life in Jesus. We are, however, going to explore it in a place where we don’t often go, the “Minor Prophets,” the twelve short books that end the Old Testament. 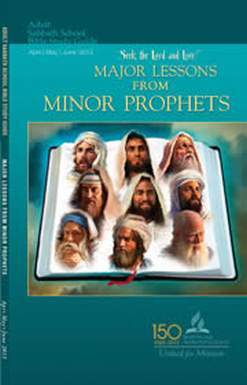 These prophets have been dubbed “the Minor Prophets” not because they are of less importance than the Major ones but only because their books are much shorter than those from the other Old Testament writers. Indeed, whether through the marriage of Hosea to an unfaithful wife, or Jonah’s attempt to flee God’s prophetic call (or at least trying to), or Zechariah’s amazing vision of Joshua and the angel (and with all the others, as well)—the Minor Prophets together have a powerful message, one that comes through again and again, which is about God’s grace toward undeserving sinners. The message is that God wants to save us from our sins, to save us from the devastation that sin, rebellion, and disobedience bring. Over and over in these books we see the Lord pleading with His people to repent, to put away their sins, to return unto Him and to find life not death, salvation not damnation, hope not despair. There is nothing “minor” about that theme. It’s present truth—God’s message to us today just as it was a message to those who lived in the time of these twelve writers who, though long gone, still speak. The question is, will we listen? The answer is, for sure, for it is a matter of life and death. Zdravko Stefanovic teaches Biblical Studies at Adventist University of Health Sciences in Orlando, Florida. He is married to Bozana, a math professor, and they have two sons. The family treasures fond memories of their twelve-year mission service in East Asia and also their twelve years of teaching at Walla Walla University. Note: Both versions of our lessons display nicely on a small screen. Our "Mobile" version uses BibleGateway, which works better for some mobile devices. On the other hand, the main version, using Reftagger from Biblia.com works better for other mobile devices. So experiment and take your pick. (We'd also be really interested in what works best for you. Write to us through our "Contact" link and be sure to tell us with what device you are accessing our lessons.) The Study References (formerly called "Helps") include all related Scripture and most EGW quotations. You will find the links in the third column of the Contents section below. The Adult Sabbath School Bible Study Guide is prepared by the Office of the Adult Bible Study Guide of the General Conference of Seventh-day Adventists. The preparation of the guides is under the general direction of the Sabbath School Publications Board, a subcommittee of the General Conference Administrative Committee (ADCOM), publisher of the Bible study guides. The published guide reflects the input of worldwide evaluation committees and the approval of the Sabbath School Publications Board and thus does not solely or necessarily represent the intent of the author(s). Sabbath School Lesson Copyright 2014 by the General Conference of Seventh-day Adventists. All Rights Reserved. No part of the Adult Sabbath School Bible Study Guide may be edited, altered, modified, adpated, translated, reproduced, or published by any person or entify without prior written authorization from the Gneral Conference of Seventh-day Adventists. Did you know that you can receive each day's lesson via email? You may also discuss each day's lesson with other Sabbath School lesson students on our blog. We also offer Teaching Outlines, Thought Starters and links to seeing and hearing the lesson online a week or two ahead of time. See our Teacher Resources page.